Hope you’re having a fantastic Friday, it’s time to vote for what you think is this week’s coolest gadget (leave a comment for a chance to win a $50 Amazon voucher). The USB Riff Rocker is essentially a USB controller for a game. You plug the little rocker into a free USB socket, download the two games off the Riff Rocker website, and then thrash your little fingers off. The full post can be found on Gadgets For Men. The full post can be found on Decide What to Buy. The full post can be found on UberReview. 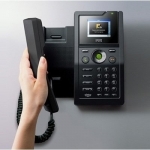 The IPEVO Skype phone blends VOIP technology with a familiar form factor. The design is geared for those that enjoy Skype but dislike using a headset. The IPEVO phone includes a 2.4 inch color display and supports both WiFi and a wired ethernet connections. The full post can be found on Coated. The Tefal Quick Cup Delux has the capacity to get your tea steaming away in your mug in three seconds. Its ability to heat water so quickly means that it saves around 65 per cent of the energy used by a standard kettle. It has an adjustable tap, anti-splash spout and drip tray, which makes it easier to dispense water into either a short tea cup or a mega-mug. This bag is new seamless mashup between Directot’s Chair and Modern Messenger Bag. The new Nespresso CitiZ espresso machine range takes its inspiration from the streets – literally – of major cities from around the globe. The colors of well-known focal points and objects, the design and shapes of buildings and landmarks, and the urban vibe and attitude of cities led Nespresso designers to create a new generation of Nespresso machines. The design is not only an improvement in looks but in the footprint of the machine as well. Compared to the Nespresso C100T Essenza – the Nespresso CitiZ takes up much less space in width, and has some new features that make it a standout. The full post can be found on Single Serve Coffee. The Thumb Saver does exactly what it says and will take a dangerous job and make it safe and simple. If you enjoy you’re DIY at home then this is a safety gadget which you must have. I really believe this is a handy gadget which will reduce many injuries in the home and workshop whilst using a hammer. The full post can be found on Tech Styling. Thanks again to all the sites for their submissions now over to you guys for voting (don’t forget to leave a comment with your reason for a chance to win a $50 Amazon voucher). I like the WiFi Skype phone… infact I’m really quite tempted to get one! The Lego theater, easily. At first I thought he had just embedded a pocket projector into the piece, but when I realized that he had actually constructed a working projector system I was blown away. Truly a feat of Lego engineering. I had to go with the thumb saver – the others are pretty cool but as someone who has hammered her thumb on many occasions, it is the most useful, and therefore coolest. there are many times in my cell phone possessing life that i would have killed for that easy backup/transfer tool. The skype phone has a cord attached to the handset???? What’s the fun of that? The chair is the best because it’s the most practical. Safety gadgets always get my vote! The thumb saver is very practical. The video of the Lego theater was great. Suggest everone watch that, it sells it. Lego movie theatre is too cool. Instant Phone Backup isn’t a bad way to go. The phone backup would definitely be a nice tool to have. This gadget would save me hours when changing cell phone!!! (usually every year). I would simply like to announce that using the thumb saver will turn you into woman: be warned. Lego Theater. Can’t get (much) cooler than that. The thumbsaver looks like it would be the most useful. Thumb Saver is perfect. Simple and useful. Nespresso CitiZ is a pretty great design, and one can never have too much java! We’ve paid to save these numbers when we’ve switched phones, so this would be a great item to have. If I had a nickel for every time I’ve smashed my thumb. I voted for the “IPEVO WiFi Skype Phone” it’s very technological and I like the concept of screen. I definitely need the thumbsaver. I smash my thumb all the time.